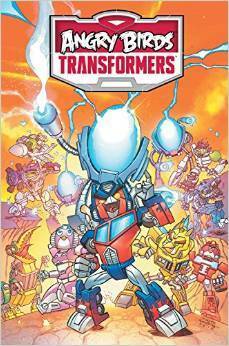 Presenting Angry Birds / Transformers: Age of Eggstinction by John Barber & Marcelo Ferreira. When the Transformers lose their powerful Allspark, it ends up on Piggie Island - and the world of Angry Birds turns robotic! Prepare to meet... the AUTOBIRDS and DECEPTIHOGS! And the crossover bonanza continues. This time it is the bodyless wonders, the residents of Piggie Island and the big machine dudes of Cybertron. This story begins long before the bots came to Earth. The war between the Autobots and Decepticons rages on as usual. In one subsequent tussle the autobots loose the Allspark, which winds up in another dimension on Piggie Island .... And so begins the Age of Eggstinction for the Deceptihogs and Autobirds. While everyone enjoys the Angry Birds games, this graphic novel seems centered to a much younger demographic than me. Its messy and ridiculous, and sadly it also didn't keep my attention for long. Maybe I would have loved it more if it were just the birds and the pigs. Don't get me wrong i'm a big fan of the Transformers franchise but these are two very different divisions, and i'd rather like to enjoy them in their separate camps ... But I think kids would enjoy this crossover romp a bit more. "Angry Birds and the Transformers equals a ridiculously messy adventure"